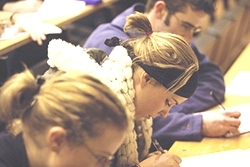 Lectures are designed to be useful starting points for research, giving a general overview of the subject, its main ideas and theories, and evidence from recent research. Together, these will guide your own reading and reflection. Glance through your notes for the previous lecture, and look for links with the next lecture. Arrive early and with all the stationery and equipment you need. Lecturers vary about whether they prefer questions during or after the lecture. They usually go quite quickly, and expect you to jot down main themes and references. Good lecturers tell you at the beginning which main topics will be covered and in which order, or write up headings. Take notes of headings, questions, sub-points, and references. Avoid writing details you can easily get later from a textbook. Keep your attention for your listening. If you are not clear where information comes from, ask. Indicate new questions raised by the lecture in a different colour. Label and file your lecture notes and any handouts. Link new information to what you already know. Discuss the lecture with others. Compare your notes and fill in any gaps. Whilst the content of the lecture is still fresh in your mind do some background reading to consolidate what you have learnt.